Maidan Nezalezhnosti (literally:Independence Square) is the central square of Kiev, the capital city of Ukraine. One of the city's main squares, it is located on Khreshchatyk Street in the Shevchenko Raion. The square has been known under many different names, but often it is called simply Maidan ("square"). 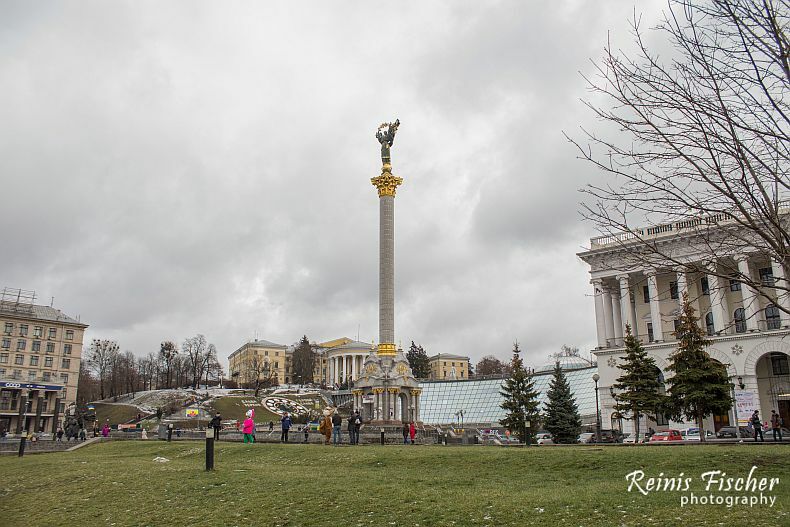 I had a brief chance to visit and make one photography of Kiev's Maidan Square at the end of 2016, during unplanned short Kiev city tour after our flight to NYC was delayed for about 10 hours at Borispol instead of waiting at airport's transit area for our flight we opted to have some Kiev tour. At that included a trip to the heart of Kiev. Since the start of Ukraine's independence movement in 1990, the square has been the traditional place for political rallies, including four large-scale radical protest campaigns: the 1989 student "Revolution on Granite", the 2001 "Ukraine without Kuchma", the 2004 Orange Revolution, and the 2013–14 Euromaidan. Maidan is also a regular site for non-political displays and events. Independence Square is one of three squares located along Khreshchatyk, close to the northeastern end of the street. It is situated close to European Square, which is the terminal end of Khreshchatyk. Besides Khreshchatyk, which splits the square in half, several other streets lead to the square. These include Architect Horodecki Street, Institute Street, Michael Street, Kosciol Street, Minor Zhytomyr Street, Sophia Street, Taras Shevchenko Lane, and Boris Hrinchenko Street. The square itself is a multi-level location. At ground level is the intersection of Khreshchatyk, which splits Institute Street (vulytsia Instytutska), and Michael Street (vulytsia Mykhailivska). Underneath the square, the Kurenivsko-Chervonoarmiyska Line of the Kiev Metro stretches across with its station Maidan Nezalezhnosti located underground.